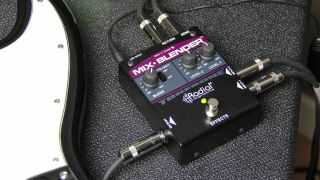 Fine purveyor of signal routing solutions, Radial has unveiled the latest in the Tonebone line, the handy Mix-Blender, which offers the ability to run two instruments into a blendable effects loop. For guitarists, bassists and keyboard players, that means running clean, unaffected tone in conjunction with effects - particularly handy for keeping low-end and definition in the mix. Both of the pedal's inputs feature 100% discrete Class A buffers and adjustable level controls, too, further expanding the flexibility. The Mix-Blender is powered via a nine-volt power supply, and available now for $169.99.